On March 29th, 2016, Swedish DJ Tim Bergling, more commonly known as Avicii, announced his retirement to touring and doing live shows. He wrote an open letter to fans thanking his team, family, and of course supporters. The letter stated, “I know I am blessed to be able to travel all around the world and perform, but I have too little left for the life of a real person behind the artist.” However, he assured fans that he would never let go of music. Just a year and a day after this announcement, his website was updated. It’s a simple layout, yet hints at much much more. Next to 2016 is a pause symbol, and next to 2017 is a play symbol. No one is sure exactly what this means, but it could signify that 2016 was only a break for him versus complete retirement. This lines up almost perfectly with his previous announcement, so we can’t help but try and connect the two. 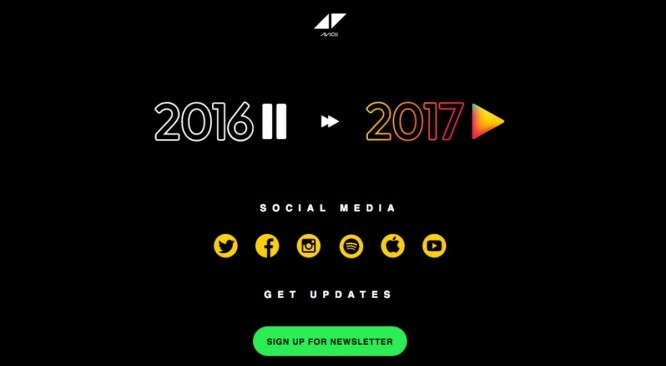 Avicii hasn’t had any official releases since his album “Stories” came out in 2015. During his remaining shows in 2016, he played some of his new music in the form of demos. He also did a few livestreams previewing his new tracks. His first big hit“Levels”, released in 2011, was really influential in paving the way for electronic music, so we can’t wait to see what’s next for him. We’ll be keeping an eye out for his new music, and you should too!